The pros, the cons, and the facts about the REC TEC Grills Bullseye RT-B380 wood pellet grill. REC TEC offers several high end, technologically advanced grills with all of the bells and whistles you could ever want; such as digital readout, and Wi-Fi equipped mobile app controls. 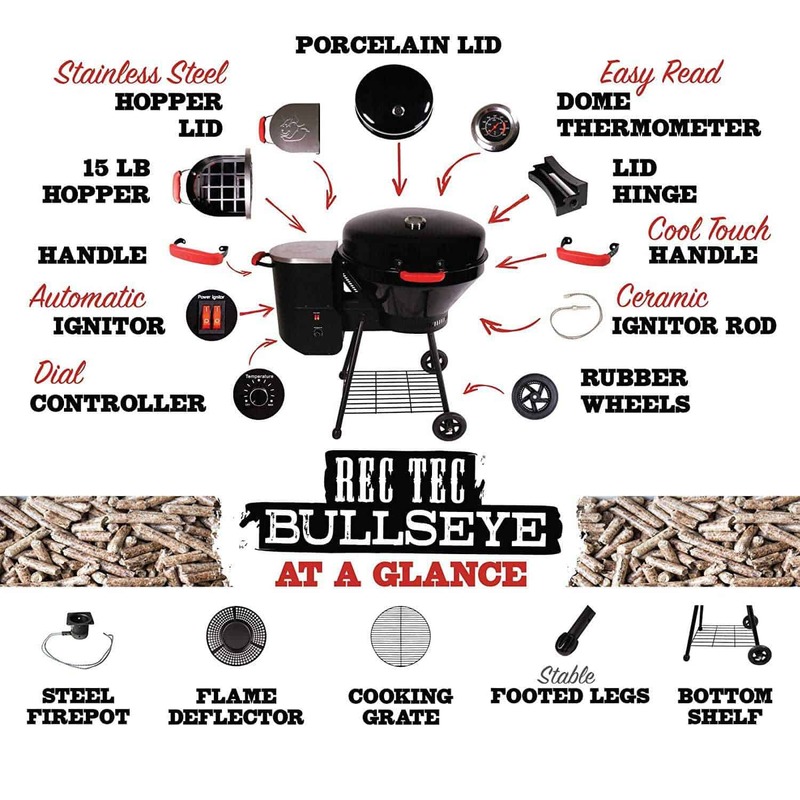 The REC TEC Grills Bullseye is not that unit. The engineers at REC TEC stripped away all of the extra technology and left the same quality craftsmanship, and durable components their customers have come to trust, but in a smaller size. The classy visual profile of this backyard icon includes just the grill and the hopper. For those that might feel a bit overwhelmed by the complexity of the new futuristic models, this more basic unit offers all of the grilling power with none of the headaches. It has a steel fire pot, enameled cooking chamber, mechanical auger, and simple electronic ignition and blower. No computers and no digital monitors. This makes the Bullseye a really solid grill that you can just turn on and start using right away. 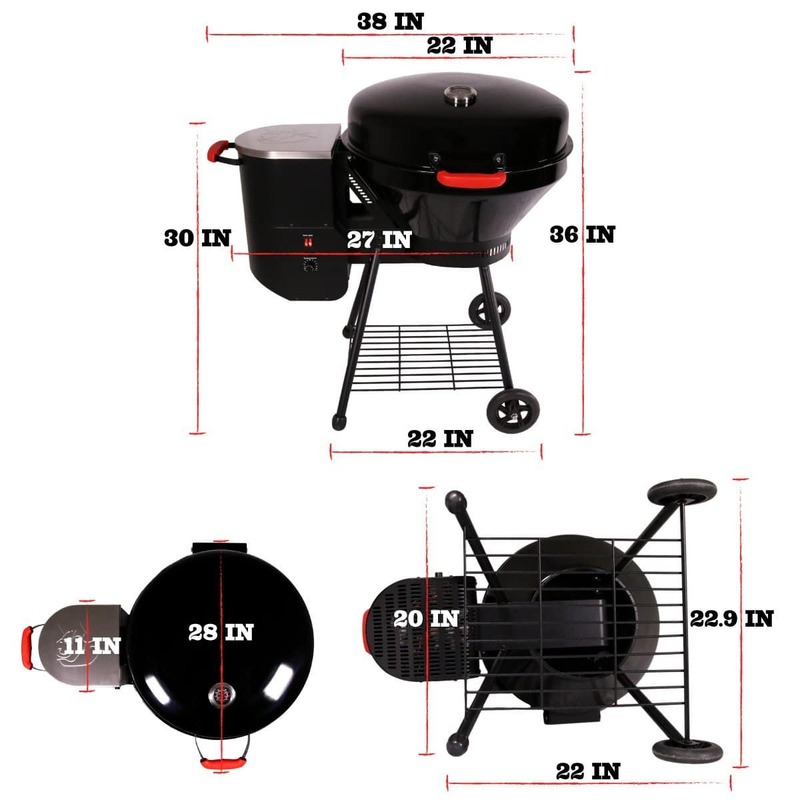 With its large cooking area, the Rec Tech Bullseye Pellet Grill can easily accommodate a medium to large family. The range of heating temperatures and removable flame deflector plate enable this unit to cook just about anything. You can slow smoke a brisket, grill tender chicken breasts, or fast sear a rib-eye without the need for another unit. On the other hand, this BBQ can be used with any other grill to give you some added versatility. While a large grilling system is great for entertaining a crowd, it can be limited by its size. Larger units take longer to preheat and use more fuel than the smaller Bullseye grill. On those nights when you just want to char-grill a few hamburgers the larger system is a hassle. However, if you want to smoke a rack of ribs in one unit and fire up a pile of steaks on the other, the Bullseye works in tandem with any other grill. This is where size meets functionality. The Rec Tec Grills Bullseye offers an impressive 380 square inches of cooking area but weighs in at just under 60 pounds. How much space is that, really? That is enough space for about 25 medium sized hamburgers. That is a lot of meat on a grill that is easy to load up in the truck and take to the in-laws. The total dimensions of this product amount to only 22 x 38 x 36 inches. That is large enough to get the job done but small enough to take it anywhere making this the ideal portable grill. At 55 pounds, this is one of the lightest grills Rec Tec offers. Don’t let that fool you, though. They didn’t cut corners on construction. The Bullseye makes the most out of every inch. Its ignition and fan are powered by a 110-volt cord, so no 220-volt outlets are necessary. For your own safety, however, you should always use a GFCI outlet. In a hurry? This is where the Rec Tec Grills Bullseye really shines. Just turn the easy dial control, and the electronic lighting feature ignites the pellets. Within minutes the interior cooking surface has heated to your desired temperature, in a range from 200º – 550º + Fahrenheit. Typically, it takes just 10 minutes to reach 400º Fahrenheit. The dome thermometer lets you know when the grill is ready. Once you have the unit hot, you can count on the porcelain coated grate to leave perfect sear marks on your steaks and burgers. The Bullseye is one of the first wood pellet grills that allows you to continue cooking even when the 22-inch dome lid is open. This way, you can keep an eye on what you’re cooking without worrying about the internal fan and burner going off and on. The wood pellet hopper, with embossed stainless steel lid, holds up to 15 pounds of fuel. Its fail proof latch assures reliable fuel consumption, so you don’t have to constantly check the flames. The Rec Tec Grills Bullseye Pellet Grill can provide an even 200º Fahrenheit all day long. It also features heat vents to protect the electronics, even during extended periods of use. One of the advantages of this unit is its ability to hold a low heat for a very long time on a single load of fuel. Nothing is more frustrating than running out of heat in the middle of smoking a rack of ribs. This unit makes that a thing of the past. Babysitting the pellet hopper isn’t a concern with the Rec Tec Bullseye. Just fill that 15-pound capacity hopper with quality hardwood pellets, and you’ll have about 15 hours of continuous smoky heat. When you are smoking a large brisket, that’s more time with your friends and family, and less time adding fuel and adjusting the heat. As soon as you unbox the unit, you will notice that the heating dial does not list exact temperatures. While the temperature dial isn’t marked with numbers, it doesn’t take long to get a feel for the controls. The quality of fuel pellets you use is going to affect the amount of heat the grill produces. Always use dry, fresh, 100% hardwood pellets for the best results. With the right fuel, the lowest setting is going to give you a steady 200º Fahrenheit. The middle of the dial is the 400º – 450º mark. If you really want to turn up the heat, the max setting will bring the interior temperature well past 560º Fahrenheit. However, you’ll want to keep an eye on the hopper at higher temperatures, as the fuel will disappear much quicker. The instruction manual has a place in the back for taking notes on the actual temperature your Bullseye achieves under various circumstances. Under the lid, you’ll find the HotFlash Ceramic Ignition system. This electronically fired mechanism ensures that your grill lights every time. You’ll never need to buy lighter fluid again, and the clean-burning hardwood pellets offer superior flavor, with less ash. The cooking chamber, itself, is coated with durable porcelain enamel for insulation and ease of maintenance. A durable, stamped flame deflector plate sits atop the steel fire pot, ensuring even heat distribution. The Rec Tec Grills Bullseye RT-B380 comes with a porcelain coated cooking grate which gives amazing sear marks and cleans up faster than a standard stainless steel grate. The round shape of the Bullseye gives it a very classic look. It really hearkens back to the days of watching your dad flipping burgers at the neighborhood block party. You know; back before you cared about things like fuel usage and ease of cleanup. The glossy black exterior is clad in high-temperature threshold, durable, baked on porcelain enamel. Just wipe it down after each use, and it will shine for years. Heat resistant handles and fixed rubber wheels make it easy to maneuver. Its four legs enjoy the stability provided by a bottom storage shelf. Overall, the Rec Tec Bullseye just looks like summer. Rec Tec is known for offering a range of wood pellet grills that suit every skill level, from first-time backyard hobbyists to competition cooks and professional chefs. The Bullseye was designed to cater to the needs of all them. It offers easy to understand features that will have you grilling perfectly seared steaks and slow smoked briskets, without the hassle of a more complex grilling system. 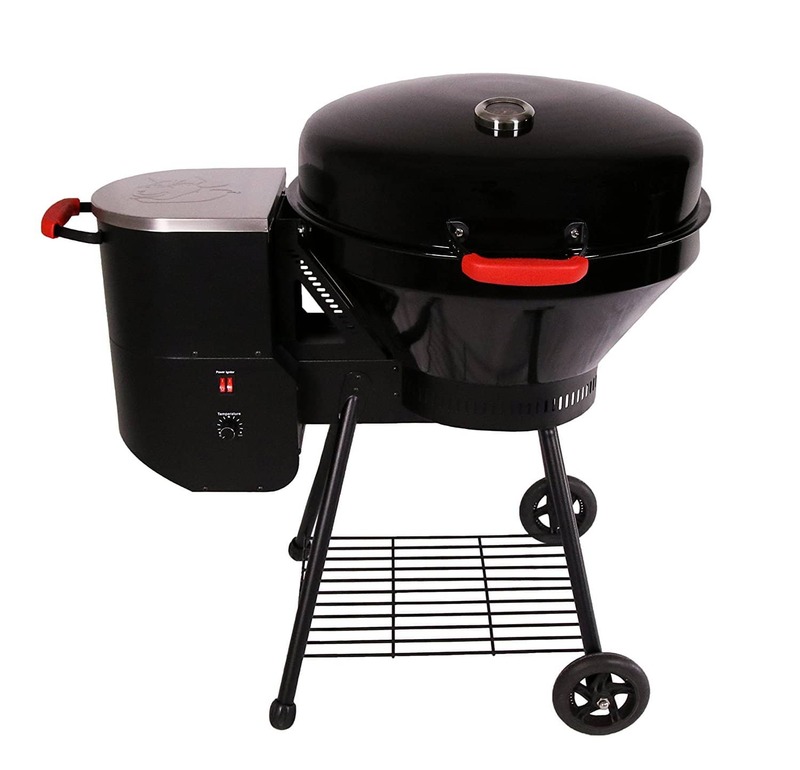 If you are new to grilling, or if you have never used a wood pellet grill before, this is the perfect model for you. Wood pellets give you the flavor of charcoal, the smokiness of real wood, and the ease of gas, all in one. You literally just fill the hopper and turn it on. This is an economical little number that will introduce you to the world of pellet grills and should provide years of reliable service. Seasoned professionals will also appreciate the efficiency of this grill. It really is one of the fastest heating units on the market. What it lacks in optional add-ons it makes up for in sheer firepower. This is truly a grill for every occasion. One of the only drawbacks to the Rec Tec Grills Bullseye is that it ships out fully disassembled. The assembly instructions are easy enough to follow, but when I’m ready to fire up a new grill I’d rather just unbox it and start grilling. However, there is something to be said for building anticipation. The unit comes with a 1-year limited warranty that does not apply to the paint, grill cover, or damage caused by corrosion. Rec Tec does offer a custom cover for this unit, but it’s sold separately. While this warranty isn’t one of the best in the industry, they do have a responsive customer service line, if you run into a problems along the way. Your call will be answered by a real person, which is a novelty in itself. The MSRP on the Rec Tec Grills Bullseye is a reasonable $499 for just the base unit. You can often get it for a bit less from the manufacturer’s website. That isn’t a bad price for an entry level pellet grill. If you want to include the cover, you can get it as part of a package bundle that includes the cover, grill pad, and 80 pounds of premium hardwood pellets for an additional $100. That is a steal if you ask me. 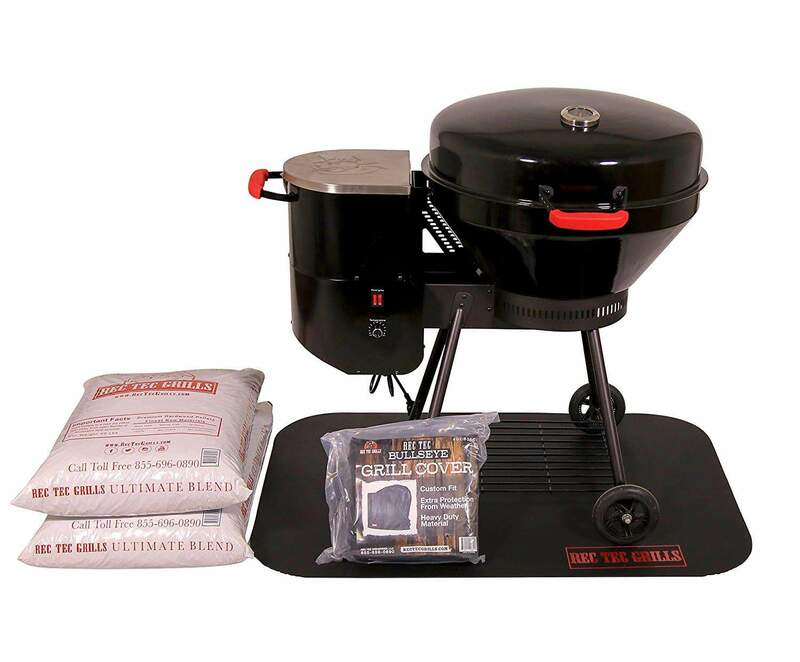 The Rec Tec Bullseye Pellet Grill is a reliable, user-friendly piece of equipment. Does it have the latest technology? No, but it doesn’t claim to. The beauty of this grill is in its simplicity. It heats up quickly, grills evenly, and goes anywhere. It is a bit of a hassle to put together, but once that’s done you will want to enjoy this easy-to-use unit every day. Overall, I give it 8 out of 10 stars. 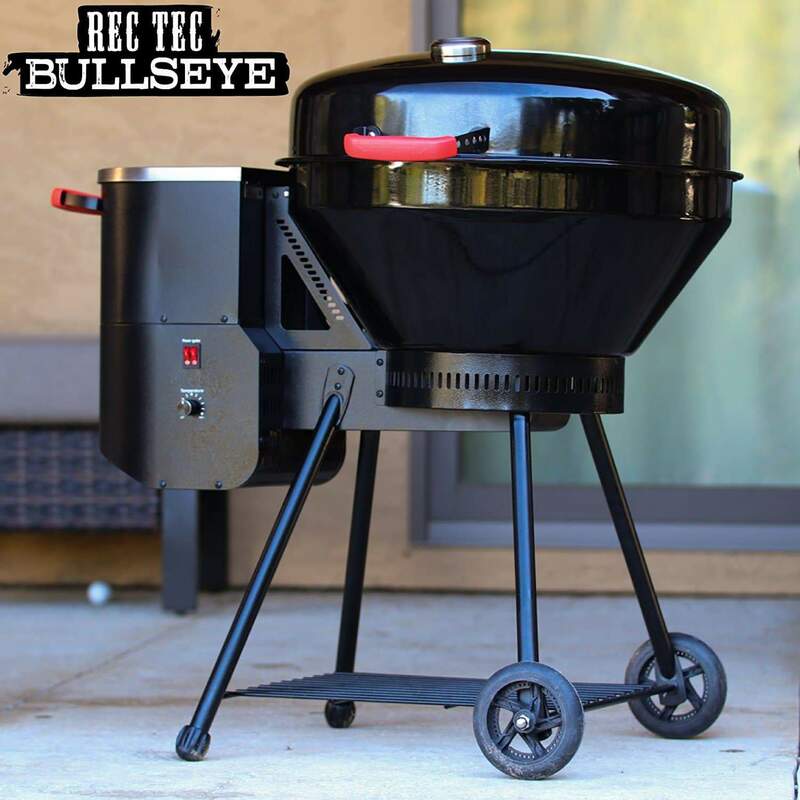 I hope this Rec Tec Grills Bullseye RT-B380 Wood Pellet Grill proves helpful for you. 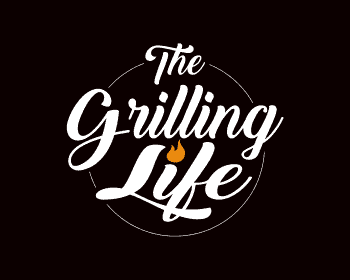 As always, if you or someone you know is interested in venturing into the world of pellet grilling; please consider sharing with your friends or on social media. I appreciate your support!